A Jacksonville researcher has developed a way of sewing up patients after hysterectomies that stands to reduce the risk of complications and simplify the tricky procedure for less-seasoned surgeons. Oh, and he’s 14 years old (Tony Hansberry II). He says that his remarkable accomplishments are merely steps toward his ultimate goal of becoming a University of Florida-trained neurosurgeon. “I just want to help people and be respected, knowing that I can save lives,” said Tony, the son of a registered nurse mom and an African Methodist Episcopal church pastor dad. The seeds of his project were planted last summer during his internship at the University of Florida’s Center for Simulation Education and Safety Research, based at Shands Jacksonville. 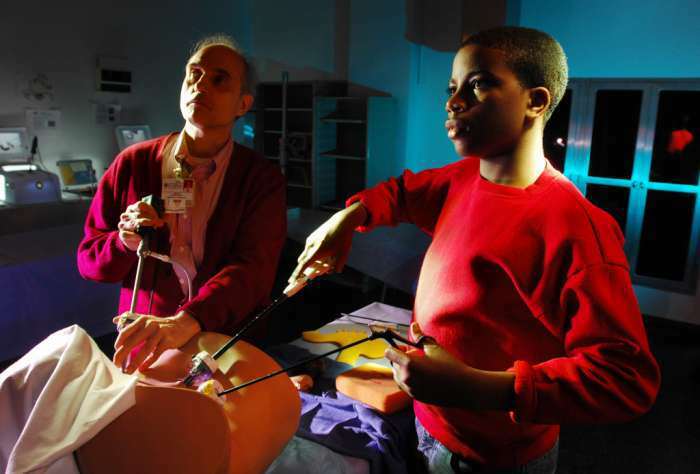 At the simulation center, where medical residents and nurses practice on dummies, the normally shy student warmed up to the center’s administrative director, Bruce Nappi. In turn, Nappi, a problem-solver with a Massachusetts Institute of Technology aeronautics degree, found someone willing to learn. One day, an obstetrics and gynecology professor asked the pair to help him figure out why no one was using a handy device that looks like a dipstick with clamps at the end, called an endo stitch, for sewing up hysterectomy patients. In other procedures, it proved its worth for its ability to grip pieces of thread and maneuverability. What Tony did next is so complicated that the professor who suggested the project has to resort to a metaphor to explain it: “Instead of buttoning your shirt side to side, what about doing it up and down?” Brent Seibel said. Here’s the literal explanation: The problem was that the endo stitch couldn’t clamp down properly to close the tube where the patient’s uterus had been. Tony figured that by suturing the tube vertically instead of horizontally, it could be done. And he was right. “It was truly independent that he figured it out,” Nappi said, adding that a representative for the device’s manufacturer told him that the endo stitch had never been used for that purpose. Tony’s unpracticed hands were able to stitch three times faster with the endo stitch vs. the conventional needle driver. Further study may prove whether the same is true for more experienced surgeons, Seibel said. In addition to cutting surgical time, the technique may help surgeons who don’t do many hysterectomies because it’s easier to use the endo stitch, he added. Tony often speaks in the highly technical, dispassionate language of doctors. In that respect, he’s not the exception but the rule at Darnell-Cookman, said Angela TenBroeck, the school’s medical lead teacher. But he has surged ahead of others when it comes to surgical skills.